11-8-15, Pentecost 24 (PR) Traditional, Are You Limping Through Life? I am not entirely sure of the advice I should share with you as your pastor, in the face of the terrorist attacks upon the city of Paris. But I would remind you that the world is never in as hopeless a state as it sometimes appears to be. I would ask you to strive to be a person of peace and justice in every situation you encounter – God knows, we need that. I would invite you to be discriminating in digesting the kind of silliness that sometimes shows up on social media. I would ask you to pray for the families of victims, the survivors of attacks, and all those who strove to bring order out of chaos on Friday night. I would ask you to have courage to still look at the world through hopeful eyes. As Christians, we are never defined by any one moment in history, except that moment on Golgotha when Jesus first succumbed to death so that God could conquer death three days later in a garden tomb. It is that moment in time, that allows us to face the craziness of the world, and still get up in the morning and see goodness. Pray that all those personally touched by this tragedy, may in time wake up to a world and see goodness again, too. God of life, we trust you to overcome any evil that humanity can bring to the world, through your Spirit of life, love, and justice. Be present in clear ways to all those who lost loved ones in Paris, and bring healing to their nation. Amen. 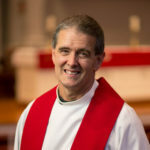 I have always appreciated the positive perspective on life and faith that is here… the broad range of life/social/political perspectives in our congregation… and the staff with whom I am blessed to work.